Four elements make up Knowledge Management Governance. Expectations, metrics, rewards and support. Governance is often the missing element in Knowledge Management, and although it is one of the four legs on the KM table, it is the one that gets least attention. This is partly because governance is not easy, and partly because there is no clear published model for KM governance. 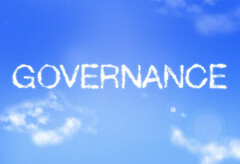 Governance represents the things that the organisation does, and the management of the organisation does, that drive the KM behaviours and adoption of the KM Framework. We see four elements to governance - expectations, metrics, rewards and support. The first thing management needs to do in terms of governance is to set the expectations for KM. This requires a set of clear corporate expectations for how knowledge will be managed in the organization, including accountabilities for the ownership of key knowledge areas, and the definition of corporate KM standards, KM principles and KM policies. These documents should tell everyone what is expected of them in Knowledge Management terms. Different departments can then add to these expectations, and individuals with KM roles will have KM expectations written into their job description (see examples here). Within a project, the expectations are set by the Knowledge Management Plan. Expectations may also be set using the competency framework. If there are no clear expectations, nobody will know what they should be doing in KM terms. If standards and expectations have been set, then the organisation needs to measure against these expectations. For example, if the corporate expectation is that every project will conduct a lesson learned session, and every knowledge topic has an owner, then you should measure whether this is happening. There are other types of KM metric as well - see these blog posts for more discussion. If there are no metrics, then nobody will know what people are actually doing in KM. If you are measuring people's performance against the expectations, then this needs to be linked to rewards and recognition. If people do what they are expected to, this should be reflected in their rewards. If they don't do what is expected, then there should be a sanction. See these blog posts for a wider discussion of incentives. If there are no links between metrics and reward/recognition, then nobody will care about the metrics. Particularly important are the sanctions for not doing KM. If people can dodge their expectations and get away with it, then this sends a strong message that the expectations are actually options, and not expectations at all. It is unfair to set expectations, measure people against them, and then reward people based on these measures, unless you make the expectations achievable in the first place. Therefore you need to set up the systems, the training, the coaching, reference materials and so on, that make it possible for people to meet their expectations. If there is no support, then you have set up an unfair system which people will resent. Together, the quartet of Expectations, Metrics, Reward/recognition and Support form the basis of an effective Knowledge Management governance system.